I’ve made some progress on the needlebook this weekend. I’ve reached the end of the borders and started filling in leaves and petals. The space with the green threads hanging loose to the left is where a button will eventually go. The interlaced running stitch ended up taking me a few tries to get right, but I’m very pleased with the results. 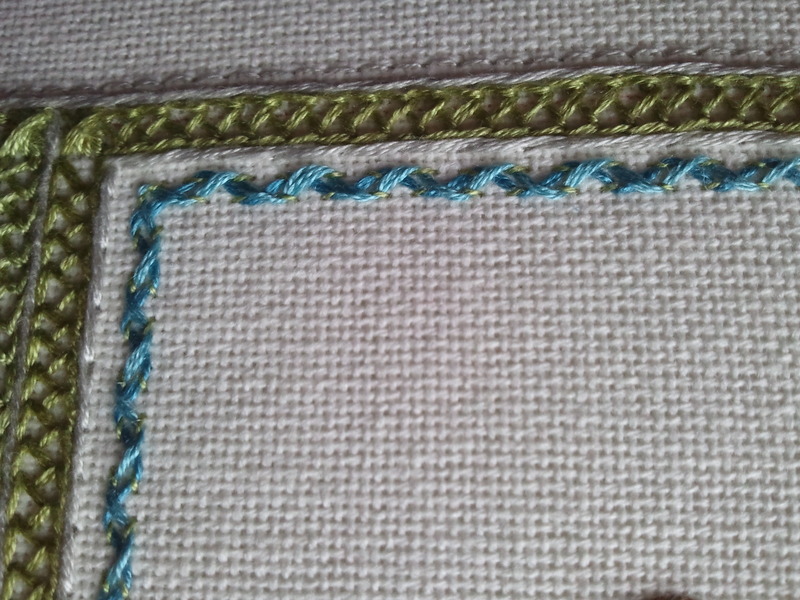 Later this week I’ll show why it took my a few tries to get right, for such a simple stitch. In retrospect, it’s obvious, but when I first made the stitch, I couldn’t figure out why it looked so very much not like the picture. I’ve been looking forward to filling in the petals with long and short stitch. Hello, blue thread. You look lovely. 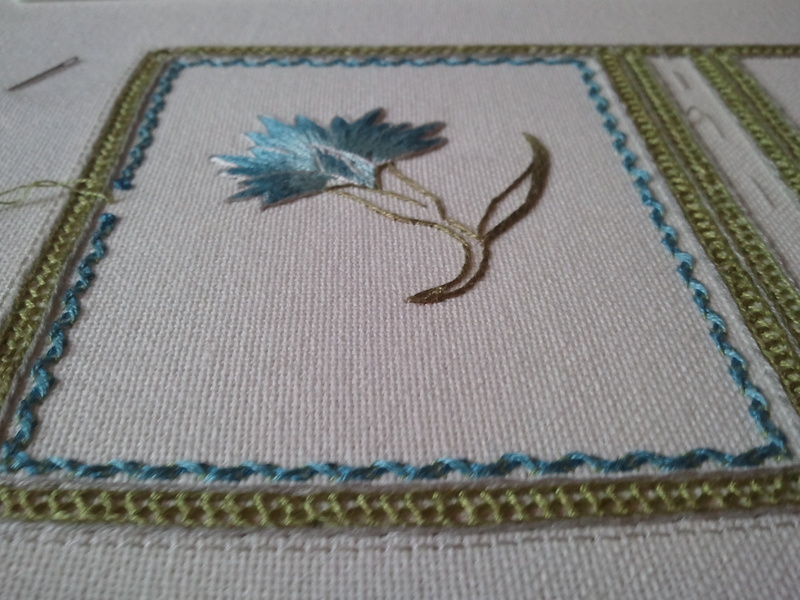 I’m not completely satisfied with the gray stem stitch around the petals. It’s a pretty alternative to a dark blue outline, and I like it when I’m staring at it up close, but from far away, it fades a bit. Possibly it’s too close in tone to the blues. 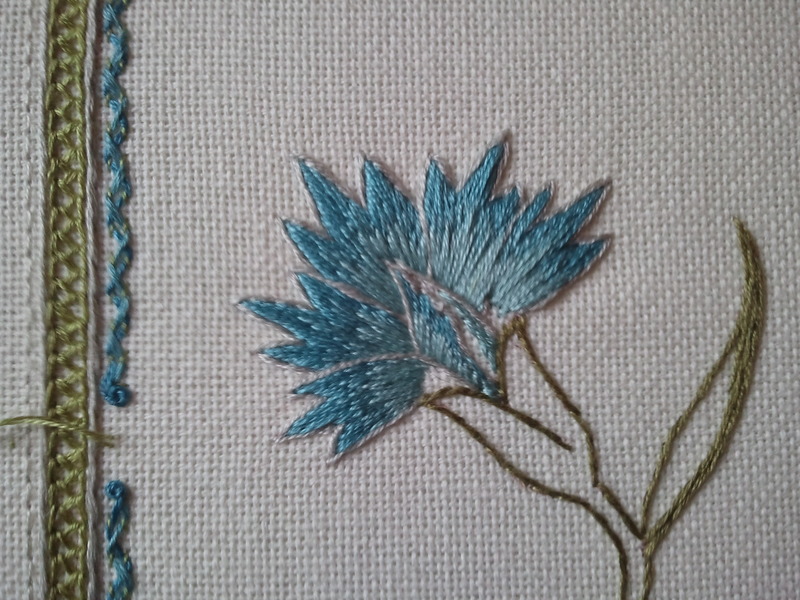 I’m considering adding a few darker blue stitches at the edge of the petals, or going in another direction and adding some silver blending filament to the stem stitch for some sparkliness. This entry was posted in Uncategorized and tagged carnation needlebook, embroidery, flowers, interlaced running stitch, needlebook, surface embroidery by Rene. Bookmark the permalink. That’s a lovely shade of blue for the carnation petals. I reckon the silver blending filament would be the best decision for livening up the grey outlining of the petals (although I actually like the grey outlining as it is).